Got up at 5:30am (4:30PST). Spent 5 hours at a great Saab repair shop in Salt Lake City. Tow driver bent my hitch, and missed my exit. This trip has long ceased to be a vacation. It’s about survival. Getting me, and the car, home with the least damage. In that order. What’s that smell? Is that a gust of wind, or has the car stalled? If I break down here, where’s the nearest decent repair shop? I have one more AAA tow left. Will drive today until I (or the car) pass out. 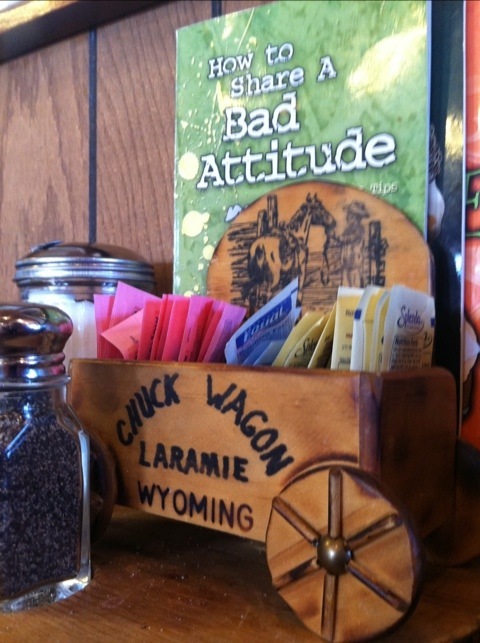 Every minute at the Chuck Wagon restaurant is another minute on the road later. Have you given my regards to the best looking cowboy at the Chuck Wagon?